This Armour perspex door locker is manufactured in the UK to the highest standards. 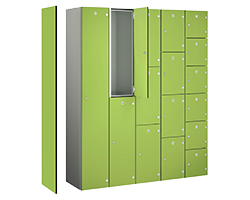 The body of the locker is manufactured from durable powder coated steel and is fitted with 10mm Thick perspex doors making them ideal for wide range of environments - retail outlet staff rooms, venues, public areas and anywhere you require secure storage with visability. The lockers are fitted with standard mastered cam locks with 2000 differs - other lock options are available including coin return locks in £1, €1 and 2 Euro coin versions - ideal for public spaces and personal effects lockers. A sloping top option is available, which prevents clutter gathering on top of the locker. Please note that if padlock fitting is chosen as the lock option, a padlock is not included but is required to operate each door of this locker. Our 40mm combination padlock is the most popular choice sold with our lockers.